This has been an exceptionally nice stop. The tropical depression did spin up into our very first tropical storm, but we had some good luck and it took a big zig north in the night before it got to us. We were on track for it to either pass below us or directly over the top, but it took just enough of a jog north to leave us on the downwind side of it with significantly lighter winds than we would have had otherwise. The max windspeed we saw on our anemometer was 38 knots, which only happened in a gusty squall. Rob & I were both awake off and on overnight, and when the wind really piped up at 5:00 in the morning I got up and realized we had moved quite a bit from our original location. The good news was that we were now facing into the harbor, leaving plenty of room behind us to drop out another 100′ of chain, which was enough extra weight and scope to keep us in place throughout the remainder of the storm. Our friend Greg who single hands a Tayana 37 with a manual anchor windlass spent from 4:00 am until about 7:00 am resetting two anchors to keep from dragging, no doubt pondering the notion of a power windlass as a future purchase. Af ter the storm passed by we did rent a car and toured the island. It’s a lovely place with lots of interesting sights. The Yapese are truly caretakers of their culture and work hard to manage a life of both traditional and modern values. One of the most interesting and certainly unique facets of their culture is the stone money. I don’t know when the tradition began, but they decided that stone from Palau, which in earlier times was very difficult to get, had value based on how difficult the journey was when it arrived. It was carved into circular shapes with a hole or two in the middle, allowing a stick to be inserted for carrying. But it really didn’t move much once it was on the island – it was grouped in “banks” near people’s homes or traditional community centers. While ownership of each piece of money might change, the locations did not. During the Japanese occupation they surveyed the stone money pieces and counted over 25,000. 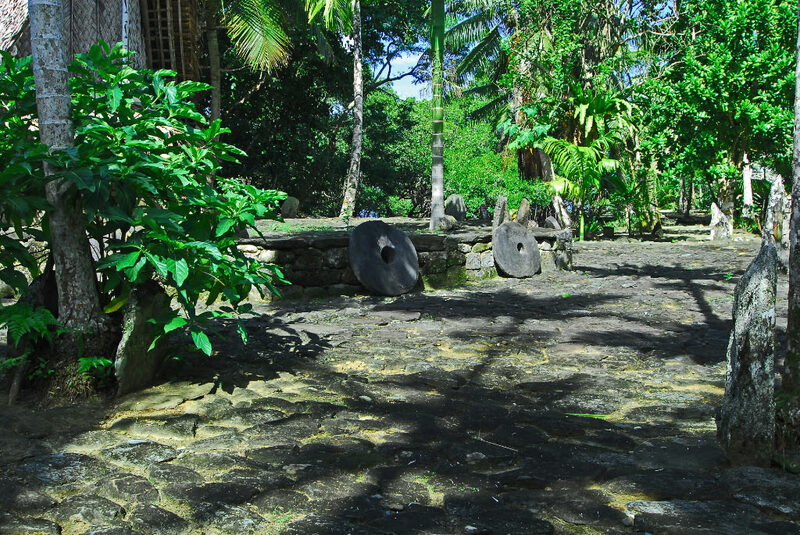 Even today the people of Yap consider the stones valuable. Hollywood produced their version of the story of Yap’s stone money, telling about an Irish seafarer who was shipwrecked in Yap in the late 1800’s and was ingenious enough to help get stone money delivered from Palau. We’re hoping to find a copy on Netflix when we get home. The Yapese also continue to enjoy traditional dancing. They have contests throughout the season, which ends at their festival in early March named Yap Days. We missed Yap Days by a couple of weeks, but our friends who arrived a week earlier than us got to see one last dance of the season and we’re sorry we missed it. All in all we enjoyed seeing the beautiful sights of Yap and were glad the weather settled for some touring. Today we finished up the domestic chores and got the boat ready for our passage to Palau. All four boats in the harbor are scheduled to meet the officials at the dock at 9:00 am tomorrow morning, hoping to be out the pass and on our way by 10:00. It’s 255 miles to Palau, so we should arrive Monday while there’s still enough light to get into the harbor and check in there. Today on Yohelah we’re very glad we got to enjoy the lovely people and island of Yap….